Today is the Sunday Supper edition. Today’s post we are supposed to bring something to the Sunday table that has to do with Valentine’s Day. 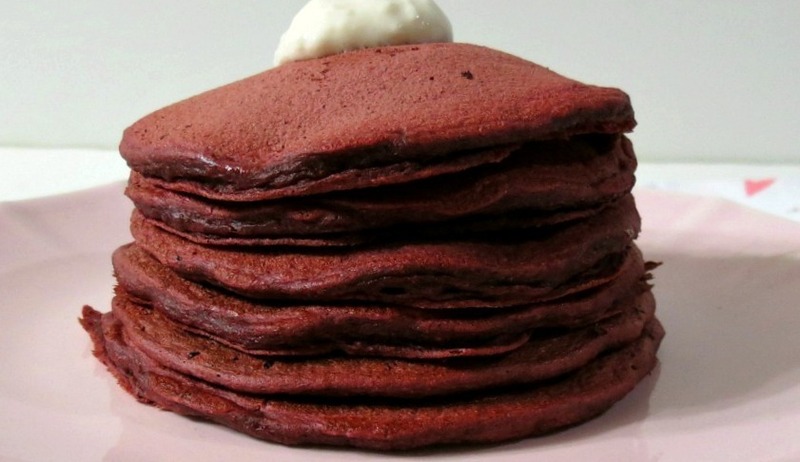 I thought chocolate mousse, chocolate pudding, cupcakes, but I settled on Red Velvet Pancakes. You know how much I love pancakes, and who doesn’t love a soft, fluffy, silky red velvet pancakes with cream cheese frosting? These pancakes are pretty healthy for you too! They are made with whole wheat flour and greek yogurt! I love my greek yogurt pancakes. I will admit I did have a few issues making these. The problem was the color. I actually made these last week and as much red dye drops I put in, I couldn’t come up with the right color. The more white flour I mixed in the darker the chocolate got. Crazy! My Husband said they tasted good, but don’t look like red velvet. Here’s what they looked like last week! See no red! So this week, I bought red dye paste and presto, red velvet pancakes were born. Since I was bringing this to the Sunday Supper table to serve, I had to make more than 6 pancakes so I upped the recipe and got 16 beautiful pancakes. 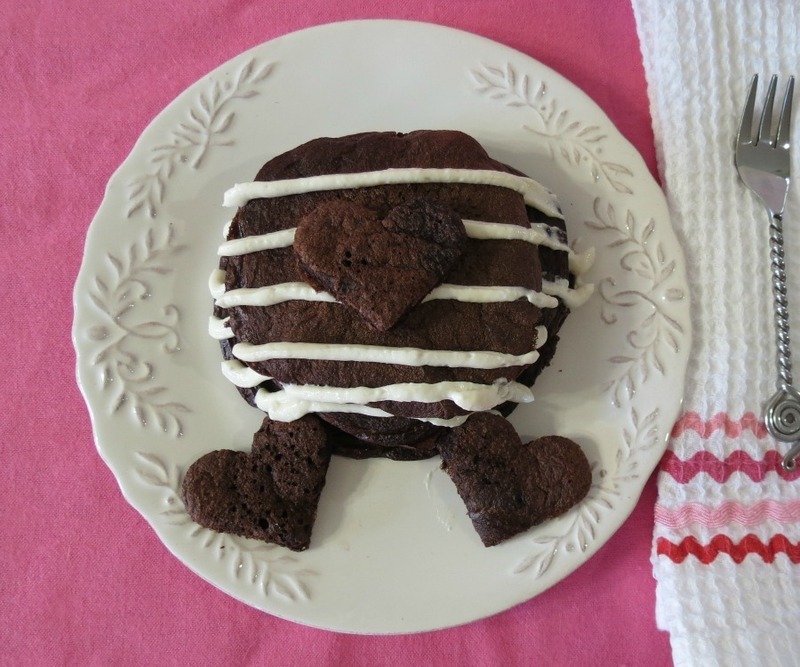 I also decided since it is for Valentine’s Day that heart shape pancakes would be perfect! I took the not so pretty pancakes, and cut out heart shapes with my cookie cutter. So cute! They are sure to bring a smile to anyone’s face that you serve them too! I really feel for the topping that maple syrup is not needed, but for red velvet you need a creamy cream cheese frosting. You can make the frosting as thick or as thin as you like, by adding more milk for thinner frosting or more powdered sugar for thicker frosting. I made mine in the middle. I couldn’t stop dipping the pancakes in the frosting, so good! I have to admit to you, this is the first time I ever made anything red velvet and I love it! I never even ate red velvet anything. I did try a piece of cake once, and my friends said the cake was not good, so don’t count it towards the red velvet experience. I am looking forward to experimenting with the whole red velvet phase. A light and fluffy pancake made with greek yogurt and whole wheat flour. In a small bowl, add milk and vinegar; set a side for a few minutes. In a medium bowl add greek yogurt, egg whites, vanilla extract and milk and vinegar mixture; mix until combined. Add flour, cocoa powder, baking soda, powdered sugar and salt, mix until combined. Set a side. In a small - medium bowl, add cream cheese, powdered sugar, vanilla extract and milk. Beat until creamy smooth. Add more milk, for a thinner frosting, add more sugar for a thicker frosting. Place a little less than ¼ cup batter on to a medium hot skillet or griddle, cook until bubbles appear and flip pancake, approx 2 minutes per side. To keep pancakes warm, heat oven to 200F and place cooked pancakes onto a baking sheet and place in the oven until ready to eat. Frost pancakes with cream cheese frosting. To make a heart shape pancake, I took a cookie cutter and cut out the shape. I’m pretty happy with these pancakes! I will definitely make them again! I honestly can’t get over how smooth they are and my family just loved them!! Be sure to check out what everyone else made for their Sunday Supper! I just love Valentine’s Day goodies! So fun! P.S. Here is a picture of the inside of the pancakes. I get a lot of requests to show these pictures! Red Velvet Fudge from What Smells So Good? The color is definitely hard to get right. But, looks like you got it! They look so tasty! Thanks Stephanie!! You inspired me! Your recipe is going to make Auntie K very popular with her nieces and nephews. Thank you! Thank you! Yes the paste or gel works better than the dye for sure! I hope your Auntie K likes them! Oh I have never tried adding greek yogurt to pancakes before but I love the idea. I am meant to make pancakes this morning so I might give it a try today. I love greek yogurt in pancakes! It’s my favorite way to have them! 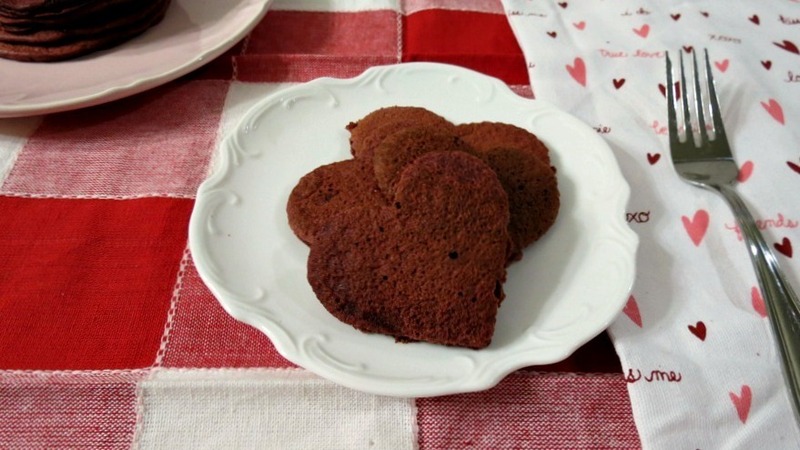 I was going to make heart shaped pancakes for Valentine’s Day but now I HAVE to make these delicious red velvet ones! YUM! Ahhh Thanks Hezzi! You can’t go wrong with heart shapes! Hi! With 5 boys I’d probably triple the recipe! 🙂 But yes it works if you double it!! If you try it let me know what you think! Ohhh boy! I am soooooo making these! Thanks for the decedent yet light pancakes! I tries your pistachio ones and loved the recipe with Greek yogurt! Can’t wait to have these! Thanks Sophie! If you make them, let me know what you think! Oooo your pancake look great! This is a fun and yummy way to start off Valentines Day. I like the heart shapes too. Thanks Shannon! I had fun with the heart shapes! Yum! They look great – and I love that you use greek yogurt in the recipe. Thanks Amanda! I use any excuse to sneak in greek yogurt in my meals!! These are seriously making me hungry this morning. They look fantastic! Until you find the right dye, the color in red velvet is challenging. Mine turned out ugly pink until I switched to paste. These sound delicious! I have to agree! It was tough! I went through a lot of bottles of dyes until I figured out paste would work better!! My husband had some red velvet pancakes when we were on vacation in Hawaii. They were no where near a healthy version like these. Now this is something I would make for him instead of those. Thanks for sharing it! I now want to fly to Hawaii and get pancakes!!! Such a great excuse to go to Hawaii!! I wonder if my Husband would by that reason?? I know I have to agree! Red Velvet anything would be good! 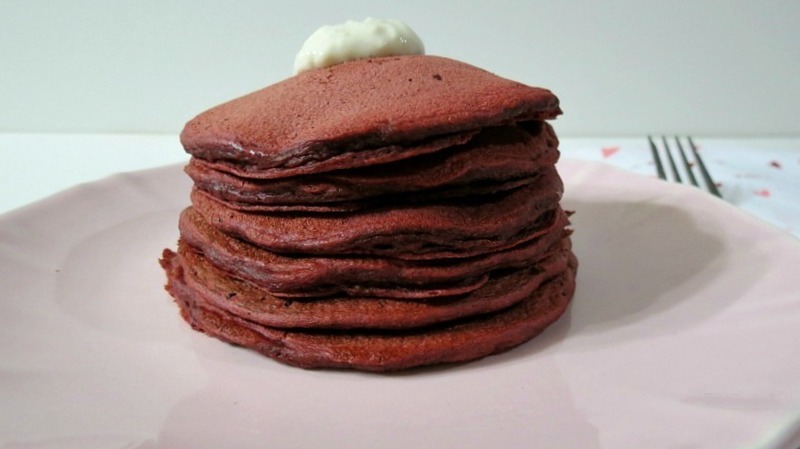 I am seeing red velvet pancakes for the first time – what a perfect time of year for anything red velvet. 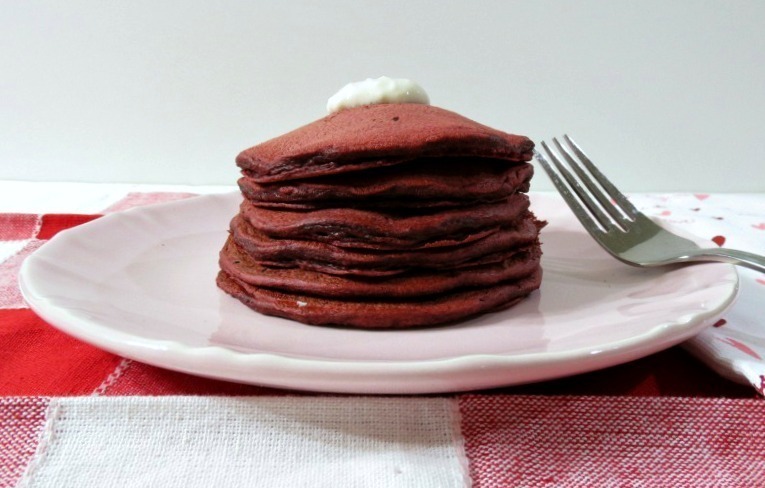 I love red velvet cake and yogurt pancakes so this sounds like an awesome combo to me! Now these are pancakes that are drool worthy. Thank you for sharing the tip about the color – I am going to have to make these ! Loved your red velvet brownies! They look amazing! Your welcome! I try to add the nutrition whenever I can! I love ww pastry flour in my baked goods and pancakes! I bet these taste fantastic, I’ve never used yogurt in pancakes! I love using greek yogurt in pancakes! I make all of my pancakes with it! My Husband who hates yogurt loves my pancakes and when I tell him there is yogurt in it, he’s shocked! Ooh these look so soft and fluffy! !I love the cute heart shapes and the lovely red color they have 🙂 Perfect for Valentine’s Day! Thanks Soni! I love the heart shape ones! Yum – love fluffy pancakes. I made red velvet pancakes this week too! I love these! I also have red-colored things on the brain. 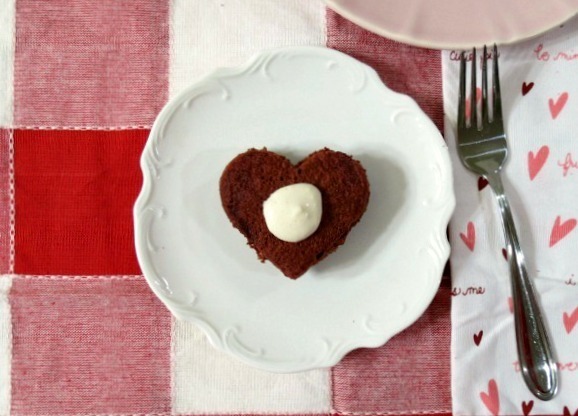 Tomorrow I’m actually posting a recipe for Valentine’s Day Beet Cupcakes. Using beets in those was so successful that now I’m curious about adding some beets to your recipe. Hmm. Will have to go experiment! Ohhh, I bet beets would be good for coloring and I would imagine you wouldn’t really taste the flavor of the beets! Red velvet anything is always a winner in my book! 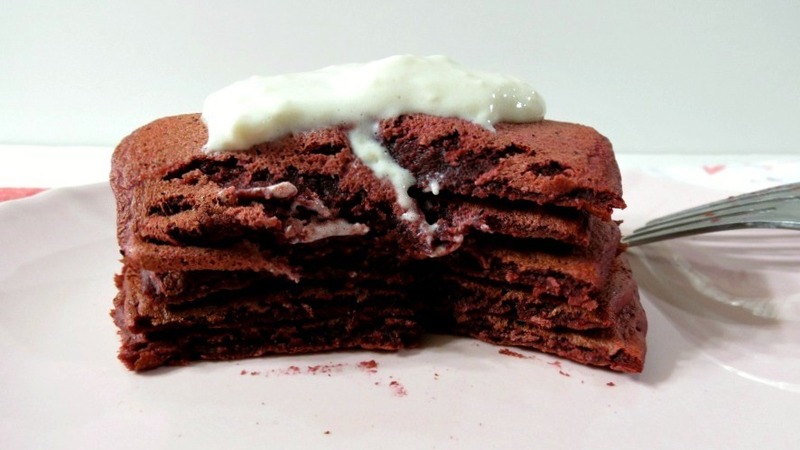 I have been dying to try red velvet pancakes…and with cream cheese drizzle on top? Ohhhh yes! I just discovered red velvet this year and I love it! It’s so Valentines! Oh my, what a special treat! Great V-day recipe. These pancakes looks delicious! Perfect for Valentine’s Day breakfast! Thanks Medeja! My family was really happy with them, especially when I surprised them with the heart shape ones! Oh my goodness! I love these! I wish I saw this earlier. . I could have made these for breakfast! Love it and love the heart shaped ones too! 🙂 my kids would love those! My husband is the biggest fan of pancakes in the world, this is a nice twist to try. Good call on the cream cheese frosting. 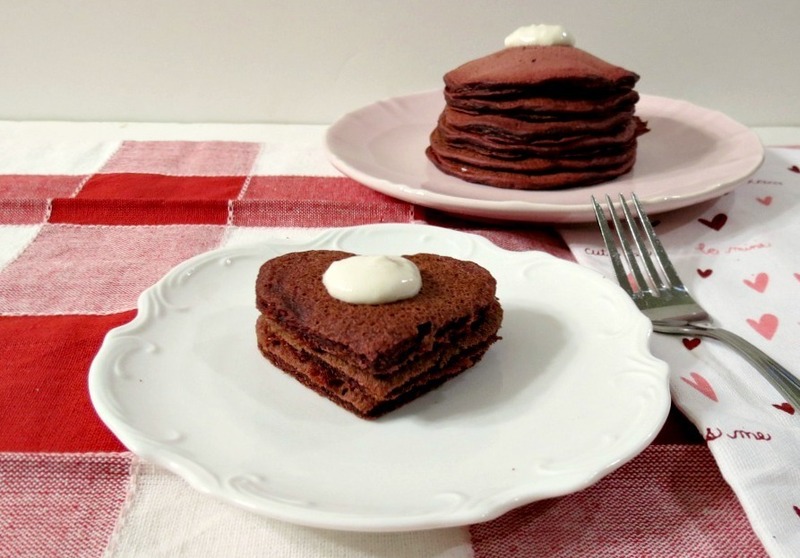 Lovely, decadent red velvet pancakes deserve no less as a topping. These look absolutely perfect! Thanks Nancy! I love the frosting on these! great way to start the day, Jennifer! Those look so very good!!! Hope you had a great Valentine’s Day!! Thanks Tara! Valentine’s day was ok, but we celebrated over the weekend, which was nice. I hope yours was good one too! !